Const. Charn Kingra speaks at a community crime forum held Sept. 10 at Abbotsford Arts Centrre. He emphasized the need for citizens to call 911 when they see something suspicious. There are two ‘wars’ being fought in west Abbotsford – one between gang members vying for turf, and the second pitting teenagers against each other in ongoing grudge matches. The result has been an escalating litany of assaults, vandalism, drive-by shootings, and the death of an innocent 74-year-old man. Abbotsford became known as the “murder capital of Canada” in 2008 and 2009, when a bloody war between the Red Scorpions (RS) and the UN Gang spilled onto city streets. As the two gangs battled over drug turf, most of the lives lost in Abbotsford as a result – six in 2008 and 11 in 2009 – were linked to the clash. Police Chief Bob Rich (in photo at left) is determined that those numbers will not be repeated. 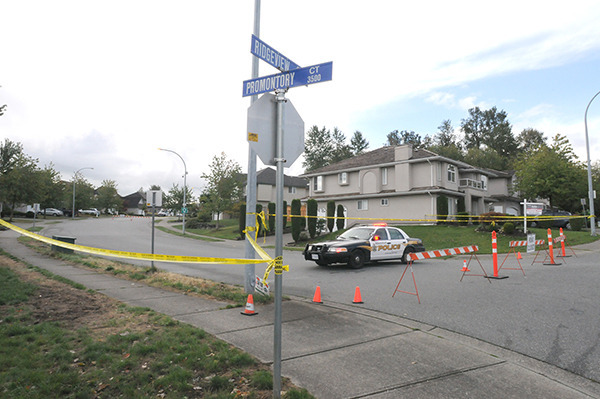 The Abbotsford Police Department (APD) is now employing many of the tactics it used in that earlier gang war to deal with the current one, dubbed the “Townline Hill conflict” – named for the area where the majority of incidents have occurred. The current conflict – ongoing since mid-2014 – involves two groups of about 40 men in total, predominantly from the South Asian community, fighting over drug territory. Rich said the gangs are fueled by the same motivation that drives most criminal activities – the lure of quick cash. And in their fight to claim drug territory, they often don’t care who gets hurt along the way, Rich said. The first major incident bringing these issues to light took place on Oct. 2, 2014, when 18-year-old Harwin Baringh was fatally shot while in his vehicle on Sparrow Drive. 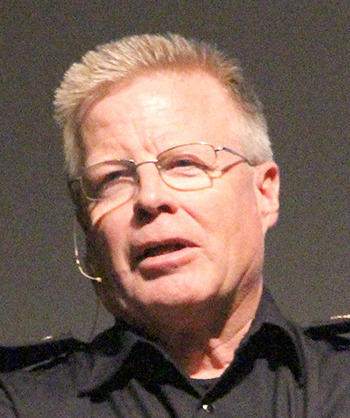 “He was somebody completely drawn up into this conflict … and he lost his life,” Rich told a community crime forum held Sept. 10 at Abbotsford Arts Centre in response to the Townline Hill conflict. A series of drive-by shootings and assaults followed Baringh’s murder. The APD’s biggest concern – that an innocent life would be lost – occurred three weeks ago on Sept. 2. Gunfire erupted on Promontory Court when a man who had been targeted stepped out of his car and onto his driveway. 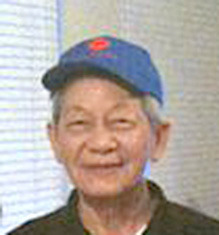 That man was not hit, but his next-door neighbour, Ping Shu Ao (in photo), 74, who was taking out his garbage, died when he was struck by a stray bullet. Rich said children were in both Ao’s residence and in the targeted home. “I’m so sorry to lose a grandpa. I pray we don’t lost a child,” he said during the crime forum. The APD has reached out to the community by holding two public forums – the first one in April saw a turnout of more than 500 people – and by meeting in more informal, smaller settings with residents of west Abbotsford, as well as with temple leaders. Among police concerns in the Townline Hill area is another, less serious conflict involving two groups of boys, mostly teens, whose dispute began in May 2014 and has involved instances of vandalism and mischief, such as smashing car windows. That conflict does not involve drugs, but some of the youths are moving into gang involvement, and have no respect for authority, Rich said. Others are at risk of becoming gang-involved. An example is a 15-year-old boy who was being investigated for an assault. Police arrived at his home to arrest him, but his parents refused to bring him outside or let police in, forcing officers to get a warrant. When the teen was arrested, he was hostile, spewing a string of obscenities at police. “What’s going to happen to a 15-year-old who treats authority that way? … If we don’t do something about it, he is lost,” Rich said. He said resources are being provided in the community and schools to help families who have troubled kids. This includes a parent co-ordinator who helps identify families needing support, and programs aimed at kids under the age of six. Police are asking the public to report suspicious activity; however, there have been some challenges getting that co-operation. In the Ao shooting, police received only one 911 call. Rich believes that could be related to a language barrier – although 911 can provide an interpreter – or a distrust of police. But the APD needs residents to be the eyes and ears of the community. Also similar to the police response to the earlier drug war, the APD has formed a gang enforcement team that has been keeping tabs on known gangsters – knocking on their doors and pulling over their cars, among other measures. The Combined Forces Special Enforcement Unit – the province’s anti-gang agency – is also involved. “The idea is to make Abbotsford a really crappy place for them (gangsters) to operate,” Rich said. Among the successes have been several charges laid against Vishal Bajaj, who police have identified as being involved in the conflict. On three separate occasions this year – the latest two arrests within a week of each other – Bajaj was allegedly found with cocaine, heroin and meth, and each time was charged with three counts of possession for the purpose of trafficking. Rich said this type of intervention helped, in part, to alleviate the previous gang issues by resulting in the arrests of key leaders and their associates. He hopes to put an end to the current situation before it reaches the levels of the former battle, but police cannot do it alone. “We have a problem. These two groups are going at it, and it will go quiet for probably a few weeks here, but if we don’t find a way to (intervene), it will continue on, so we have to change some things in order to make our community safe – together.